Well, we crazy people at 5 Minutes for Books who make all sorts of decisions (ridiculous and otherwise) really wanted to keep the Classics Bookclub around but needed to tweak it a bit to make it more reader/user friendly. So instead of hosting the Classics Bookclub every month, as we have been doing, we are making it a quarterly event. On the 5th Tuesday of every month you are welcome to come and link up reviews to any classics that you might have read over the course of the prior quarter. And to encourage you to keep up with us? There'll be prizes. To learn more about these changes, you can read what Jennifer had to say about The NEW Classics Bookclub. 1. I intend to read Anne of Green Gables, 100th Anniversary Edition (again) for the L.M. Montgomery Reading Challenge in January. 2. I'd like to finish reading The Faerie Queen, as I mentioned earlier today. 3. I'd like to read Ben-Hur which has been sitting on my bookshelves for longer than I will admit to you. 4. I'd like to read 1984 because I keep talking about how I mean to do that, but haven't gotten around to it yet. That is my very loose plan. However, I do have quite a few classics sitting around my bookshelves and since my greater reading plan for this coming year is to read what is on my shelves, I probably (hopefully) will have a few more sprinkled in there and here, here and there. What about you? Would you care to read a classic or two with us this year? 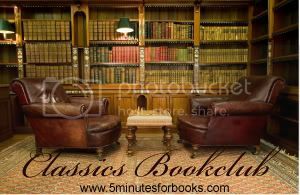 Join in with us at 5 Minutes for Books and read as few or as many as you'd like! Just let us know which they are and perhaps we'll have a little something to share with you . . . I read 1984 for the first time a couple of years ago- totally mind-blowing and I regretted not having read it in high school! You've got quite a list here- good luck!! Oh! Ben Hur. Now that's one I didn't think of. Good luck with your reading - sound interesting. 1984 is a good one! And yes, my list is very loose as well -- I might just go crazy and read more, and it's very likely that I won't read everything on my original list. First, I REALLY like this new format for the Classics Bookclub!!! I've looked at it previously, but the selection never seemed to fit in with my reading schedule at the time. So the flexibility is great!!! I purused Invitation to the Classics a year or two ago, and it is a great introduction. I found it to be one of the most helpful of several similar books I looked at at the time. The Faerie Queen is quite ambitious! I'll have to check our your earlier reviews to see if they inspire me! The Woman in White is next on my list. I love mysteries, too, having recently rediscovered my childhood obsession after reading Dorothy Sayers this year. I'm not sure if I'm ready to commit to the Children's Classics Mystery Challenge though, because there are so many grown-up mysteries I want to read! I'll definitely be revisiting Nancy Drew when my daughter is a little older! 1984? Hmmm...may have to add that to my list. When I make it. 1984 is worth all the hype. I remember being thoroughly chilled when I read it for the first time, though I do think it's heightened even more when you read Brave New World at the same time - totalitarianism from above and below makes for interesting similarities and distinctions. For the first time in my life, I have books on my shelves that I have yet to read (this is mostly due to an exuberance of birthday money blown entirely on books) so I can certainly relate! I have a problem with reading other people's lists--I see titles I want to add to my own list! I have never read 1984, and I would like to. Maybe if I finish my list, I will! I don't know if I should admit to you that I haven't read Anne of Green Gables. I'll have to add that one as well! The Woman in White is one of my top 3 books EVER.